For the unmarried gentleman of high society, the world was his oyster. At no other time in history was bachelordom such a widespread, and pleasurable, pursuit. As the turn of the century dawned, the “Marriage Question” began to shift from the issue of surplus women, but on why men refused to marry! Certainly England’s system of primogeniture pushed penniless second, third, fourth, and beyond sons out into the far and wide outreaches of the British Empire, but that failed to explain why eligible men who remained at home were content to dash from cricket match to club to house party to hunting grounds with nary a thought to acquire a spouse. In his text, The Age of the Bachelor: Creating an American Subculture, Howard P. Chudacoff argues that the bachelor subculture grew from the growing spaces created specifically for the consumption and entertainment of men–bars, taverns, barber shops, clubs, et al. I would add that men became more entrenched in their bachelordom in reaction to the increasing independence of women (the Bachelor Girls of next week’s post), which poked holes in the “normal” gender interaction of previous generations. 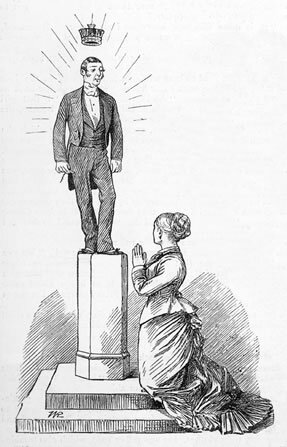 The more women moved into traditionally masculine spheres, such as higher education, medicine, law, and other white-collar positions, which also thrust these marriageable women beneath their noses, the more men retreated behind barriers which would relieve the pressure of buckling gender barriers. Now men had to navigate social interactions with intelligent, independent and unmarried (and ostensibly unprotected females who would have formerly been considered fair game) women, yet social norms maintained the thought that women needed the protection and security a husband would provide. With a female coworker of marriageable age and reasonable attractiveness at the next desk, males no longer had the buffer of “work” to separate them from the proscribed times for courtship. Out of this desire for a purely masculine domain first came the bachelor apartment. 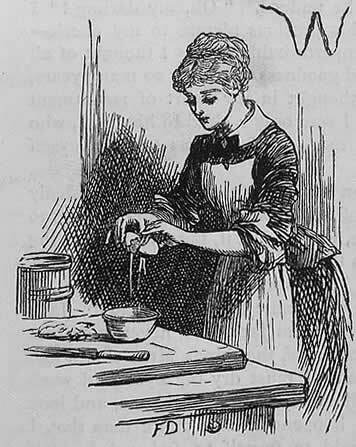 Prior to the 1880s, bachelorhood was regarded as “a mere temporary condition […] a sort of interregnum between youth and sober, well-ordered manhood.” Unmarried men lived frequently in boarding houses, and not infrequently married the land lady’s daughter or the widow who sat across from him at meals. As concepts of the unmarried state changed by the end of the nineteenth century, the pressure for apartment houses built expressly for the residence of a bachelor grew, and the most luxurious apartment homes sprang up across New York practically overnight. 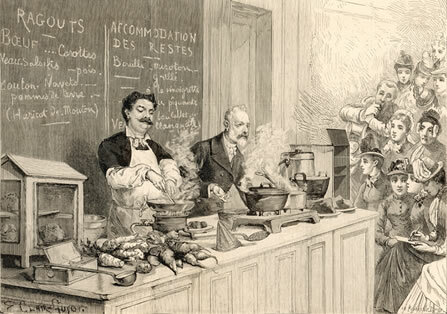 These ran from fifteen hundred dollars per year for the most up-to-date plumbing, large rooms and meals delivered by a housemaid, to modest affairs of eight hundred to one thousand dollars (but always with plumbing!). London also joined the bachelor apartment, though on a more subtle scale, as the apartment blocks were built near or around Westminster, which was a typically masculine area of the Town. Ironically enough, the rise of the bachelor apartment ushered in a fad for dinner parties where unmarried men and women could mingle in a manner quite independent of chaperons or one’s parents. However, the bastion of bachelordom–perhaps man in general–was the club. 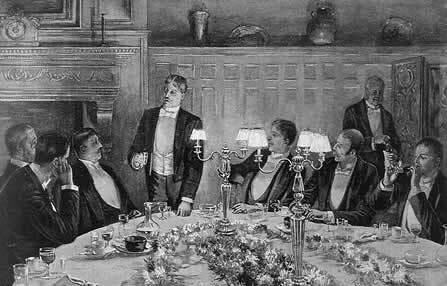 English clubs of course dated from the 17th and 18th centuries, but the late nineteenth century saw an explosion of gentleman’s clubs on both sides of the Atlantic (and the Channel) formed by all manners of men and groups. First and foremost were the political clubs of London: Brooks (Liberal/Whig), Carlton (premier Conservative club), Junior Carlton, and the Reform. 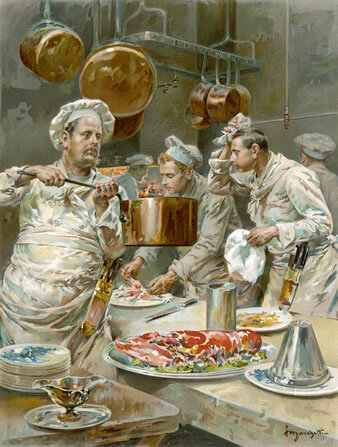 The military, which had clubs for every branch and rank (Guards’, Army and Navy, East India United Service, etc), the artistic (Athenaeum for the literati; Garrick for actors; Authors for authors, et al), the sporting (Automobile, Royal Thames, Hurlingham, etc), and social/general clubs, the most famous being White’s, Boodle’s the Junior Athenaeum, the Marlborough (formed by Edward VII when Prince of Wales), and Travellers’. In New York, under the aegis of J.P. Morgan, the city’s most powerful and most prominent men formed the exclusive Metropolitan Club, which, along with the Knickerbocker Club and the Union Club, were the most luxurious and coveted clubs in America. 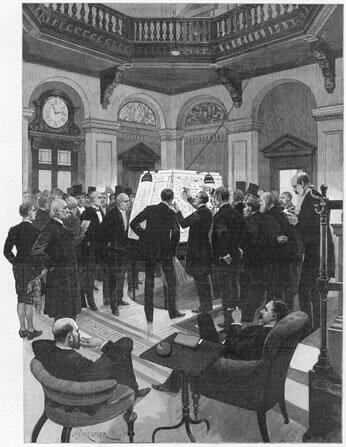 Here clubs were formed along interest lines, but unlike London society, the literati and the theater world did not mingle with the wealthy society men, and bachelors were less likely to use the men’s club as an escape from women (though this attitude declined as more English traits were adopted). The bachelor life was most amenable to the fast-paced world centered around the theater. Gaiety girls, showgirls, chorus girls, and spectacles galore, tempted the bachelor with deep pockets and even deeper cups. In London, young bachelors–most of them military men–didn’t consider themselves men if they weren’t chucked from the Empire Theatre on Leicester Square at least once in their lifetime. Broadway was a bit more seductive, as the theater district abounded with naughty music halls and even naughtier cabarets. Here, the lobster palace society, the venue of the “butter-and-egg man” reigned supreme, and where luscious, giggling chorus girls, primadonnas, and grande dames of the stage, were wined and dined all night long. 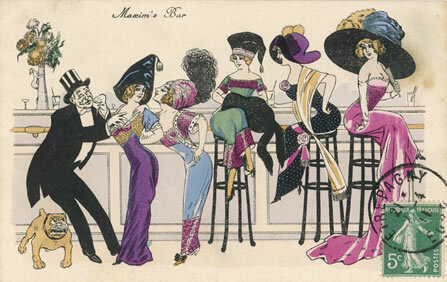 One cannot deny, however, that Paris was the destination for the bachelor who wanted to have fun with adventurous women, and among other places, such as the high-class brothels which catered to every taste, Maxim’s was the center around which Paris’s le high life formed. The food was excellent, but the service was even better, with the staff prepared for any activity in which its patrons could get into–even when Russian Grand Dukes doused the lights and began playing Russian roulette. Unlike the restaurants catering to the faster sets, Maxim’s was strictly for courtesans and gentlemen, and no respectable woman would dare enter its portals, much less recognize its existence. The bachelor life was dangerous though, and the married men who indulged in its excesses were apt to find themselves on the receiving end of public outrage–as with the infamous Pie Girl Dinner–or, well, dead (Stanford White!). Ultimately, the life of the bachelor was so utterly sublime–girls, champagne, sports–it was a wonder why any gentleman of wealth and rank married at all! However, as worrisome as the growing numbers of bachelors were to society, the most worry was saved for that frightening, independent, “masculine” entity: the Bachelor Girl. Hairstyles of this period shifted with the shifting silhouette in dress and also reflected, as the era progressed, the growing freedom and emphasis on ease in hairdressing that marked a more mobile society. The agricultural depression of the 1880s which dampened spirits, expressed itself in the somber, less frivolous clothing of the decade. This was the height of the bustle era, but somehow they didn’t seem as jaunty or frivolous as they appeared in the 1870s. This bustle was formidable and wowing in its height and width, as though ladies were adamant against being blindsided from behind. Accordingly, men’s clothing became unerringly correct and, despite the aberration that was the Aesthetic movement, dark colors, close-tailored and stout fabrics were the norm. To accompany this fashionable armor, ladies’ hair was worn close to the head and rolled tightly at the crown, with small curls at the nape of the neck and light bangs (or “fringes” as they were called in England). Hardly any man of this period were clean-shaven and their hair was clipped short and shaggy. The early 1890s saw a slight loosening of the hair, and as this decade progressed, ladies’ hair softened and ballooned nearly as drastically as their sleeves! Fringes remained, though with the slight pompadour effect, the height required need as much hair as a woman had on her head–and then some. Ever since the simple coiffures of the first two decades of the 19th century disappeared, ads filled newspapers selling all manners of fake hair. Ladies brushed their hair daily not only for cleanliness but to collect enough hair in the bristles to make their own “rats” and “pads” to bulk up their thin locks. The sale of hair became big business (hence the scene in Little Women) and to save even more time, hair companies created styled hairpieces–braided coils, ponytails, even whole wigs! No longer was it shameful for a woman to lack her own head of plentiful, glossy hair: she could buy it. The 1900s were apogee of false hair. 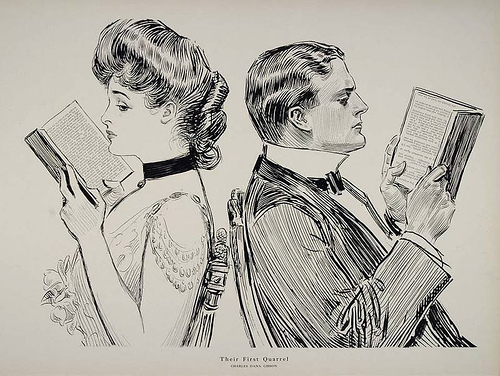 The full-blown pompadour look was in fashion, mostly inspired by Charles Dana Gibson’s iconic Gibson Girl. The sketches showed a beautiful woman with high and full up-do, and women rushed to emulate this with any manner of rats, pads and hair pieces. The Gibson Man–square-jawed, broad-shouldered, athletic, and more important, clean-shaven–inspired a new generation of young men as well. Beards had fallen out of favor and though mustaches retained their supremacy (particularly in the military, where officers were required to sport one), a lack of facial hair signified youthfulness and vigor, which matched the cavalier and derring-do spirit of the age. 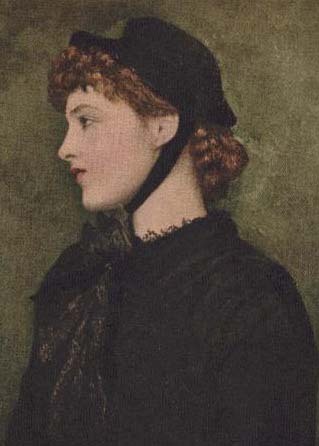 The latter part of the first century saw a widening of hats and a widening of hair to carry the wide-brimmed “Merry Widow”. However, the hair lost a bit of its height and was generally parted on the side or in the middle, and was fluffed low and wide towards the ears and nape. The 1910s saw a near abandonment of facial hair for young men. Their hair was now loose and tousled, no longer trapped by the macassar oil and brilliantine pomade of former years. For ladies, the slimming silhouettes needed slimmer hair, but rather than a retread of the 1880s, their hair was dressed so that it appeared ear-length and curled–almost bob-like beneath their close-fitting hats. 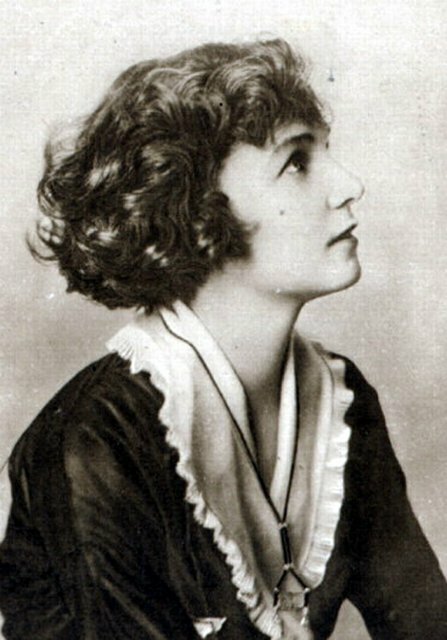 In fact, some women even went so far as to bob their hair, mostly inspired by Irene Castle who chopped her locks in 1914 before a scheduled surgery (she didn’t want to deal with caring for long hair during her convalescence). This inspired a craze for the “Castle Bob” and when Irene added a necklace around her head, the “Castle band” took off as well. The craze for bobs during the war years actually preceded the Golden or Roaring Twenties, and ironically (or not), ladies’ hair of the immediate post-war years made an attempt to recapture the twilight of the Edwardian era with a short-lived favoring of a slight pompadour. But the tide of fashion is unstoppable in progress, and the new generation threw themselves headlong into embracing hairstyles the older considered horrid and masculine, altogether forgetting the horror that met their generation’s shift in coiffure.